Elephant Ear: BLACK RUNNER (Black Ruffles, Like Magic) - 5 Medium Plants! Will be available in summer 2019. 5 MEDIUM Plants, 8 - 12 inches high. MOVE OVER, BLACK MAGIC . . another member of the family has arrived! ''Black Runner'' (also called ''Black Ruffles'') is a first cousin. ''Black Runner'' makes a stunning 6' tall clump with 2' long leaves that are much more ruffled than its better known cousin. The biggest difference, however, is the black snake-like runners that creep along the ground, dropping roots into the soil every few inches for new plants. 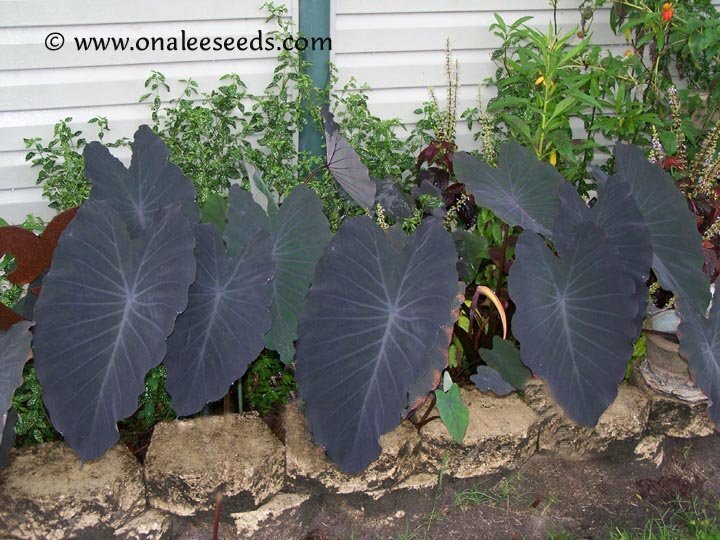 You are buying 5 (five) MEDIUM SIZED (8 - 12 inches high) 'Black Runner" Elephant Ear Plants. Leaves will be trimmed before shipping but will grow back quickly once planted and reestablished. New leaves come out green but turn black with exposure to sunlight. Shipped bare-root. MOVE OVER, BLACK MAGIC . . another member of the family has arrived! 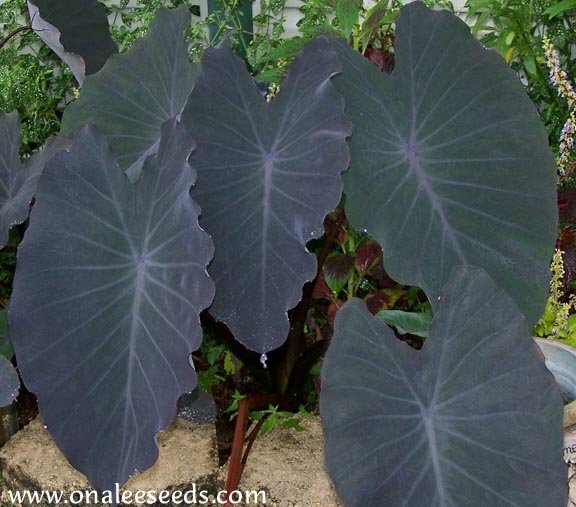 Colocasia esculenta, 'Black Runner" (also called 'Black Ruffles') is a first cousin and probably a mutation of the popular 'Black Magic'. 'Black Runner" makes a stunning 6" tall clump with 2" long leaves that are much more ruffled than its better known cousin. The biggest difference, however, is the black snake-like runners that creep along the ground, dropping roots into the soil every few inches and sending up another plant. These MULTIPLY FAST - much faster than the clumping Black Magic - and can fill in a larger area much faster with a 'spider web" of babies - each sending out it's own runners and babies as they grow. 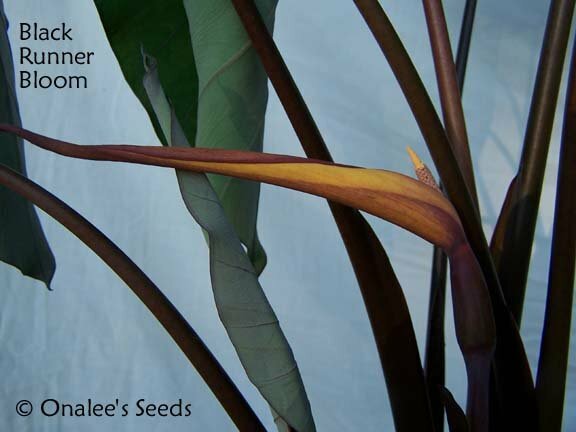 This is a superb new introduction that will soon find its way into gardens around the world - LET YOUR GARDEN BE ONE OF THE FIRST - and soon you will be able to share some of your 'Black Runner" babies with your neighbors and friends! Elephant ears LOVE WATER - use them around your Koi pond to really add drama or plant them with white Impatiens for a formal look! BUT - YOU DON'T HAVE TO HAVE A WATER GARDEN OR BOG TO ENJOY THESE PLANTS! I have mine planted in average, sandy soil and they are doing great with regular, average watering. The leaves on these start out green with deep purple/black veins. In the sun, this turns to a deep purple/black over the entire leaf in deep shade, it will stay more green with black veins - it needs some sun to really bring out its full potential. These plants are hardy in zones 8 and warmer bulbs may be lifted in the winter in colder zones and stored. You are buying 5 (five) 'Black Runner" Elephant Ear Plants. Each is from 8- 12 inches high. MOST OR ALL OF THE LEAVES WILL BE REMOVED FROM THESE PLANTS FOR SHIPPING. I have found that they recover much faster if the leaves are removed new leaves will start to grow within a few days of the plants getting re-established in their new home. The new leaves will come out GREEN and then change to black as they are exposed to the sunlight. These look GREAT planted in groups and you'll have a fast growing group already started with these plants! I include planting instructions with all my plants and seeds.